Vendors do have to take all cards of a certain type, this seems to be universal in the card contracts.. so if they take visa they must take all visa etc. they can't decide that halifax pissed them off so they won't take their cards. OTOH enforcing that isn't that easy as a retailer is free to decide they don't want to serve someone (subject to discrimination laws of course) so in practice there's nothing really stopping them. But as you say - enforcement. Not a trading standards thing, purely contractual with card processing company, and the consumer is not a party to that contract. The problem with monzo often is incompetence on the part of retailers and card processors. Completely new banks don't appear very often to show this up..
BPF repeatedly stated that mastercard debit did not exist therefore I had to pay a 5% credit card surcharge (which on a loan repayment is a decent amount of money). The local gym finally admitted they only update their card database once a year and we'd have to wait until next april to be able to pay them.. (contractually they should update monthly at least). The get-out there is that they may take all Mastercard and Visa cards that permit offline auth (i.e. not prepay, not Visa Electron, not the Mastercard Debit or Maestro equivalents of Electron). Have you punched a hole in your Monzo card? That was for a different picture, with a padlock through the card... It is a dead / old card anyway. Does this ruling against card surcharges apply to B2B transactions too? Or only Consumer-2-Business? With my merchant accounts some Visa and Mastercard transactions are more expensive than AmEx. Many people refuse to take AmEx on the grounds it is too expensive, yet are happy to take Visa and MC without even checking if it is a Premium/Rewards/Business Visa or MC, which may well cost them more than the AmEx rate! As you say many businesses will take debit cards only - and either refuse credit and charge cards or surcharge for them. This again demonstrates little knowledge by the business. Accepting debit cards is changing to a percentage fee, from the current fixed price (e.g. 40p per txn) model. Taking cards has massively improved my cashflow and taking credit/charge cards and taking AmEx have made even more of a difference. Sorry but B2B as well, which is a bugger. No, banning B2B card surcharges is a good thing. We buy far more by card than the payments we receive by card. And we have never charged our clients any card surcharges on their card payments to us. So, overall, this is a Really Good Thing. Is it simply "all card payments" or will firms have a get-out for AmEx by saying "it's a charge card, not a credit card, so we can still surcharge". Amex too... I can recommend a good lawyer that has researched this all for us. “On my advice on the card and cheque fees, I need to amend one bit: payments made by “commercial cards” can be subject to a surcharge no more than your costs. A “commercial card” is “card-based payment instrument issued to undertakings or public sector entities or self-employed natural persons which is limited in use for business expenses where the payments made with such cards are charged directly to the account of the undertaking or public sector entity or self-employed natural person”. So not quite so clear! So it does apply to business purchasers, but not if they use a “commercial card", so use personal card and claim on expenses! My understanding is that some credit cards are deemed 'commercial' and some deemed 'business'. How are they going to square that one? And when you take out an AmEx card, even if the account is in the name of a Ltd Co then AmEx still make the individual cardholder legally liable for the full bill. So, is that a card 'where the payments made with such cards are charged directly to the account of the undertaking' given that the individual is contractually liable for the full spend and the full monthly payments? And, yes, there are databases (available on the Internet) that give a rough feel for the type of card one is looking at by decoding the 15 or 16 digit PAN (card number) but not sure how accurate those databases are. I have quite a few cards for various personal / business activities and some of my card numbers don't match up on the card number database I look at. As for the surcharge being "no more than your costs" I believe this cost is impossible to work out with certainty at the point of the transaction. The merchant account fees will generally comprise a fixed fee element and a variable fee element and all depending on the card type and this will only become apparent after the transaction happens. So does the seller charge the buyer solely the principal amount, take the payment by card and then issue a card usage surcharge fee in a month's time once they have received all statements and know exactly what that card payment cost them in fees ? And, then, if you take that follow-up payment by card do you then wait a month to work out the surcharge on the surcharge payment. And then at the end of month 3, you work out the surcharge on the surcharge on the surcharge. Totally unworkable. Yes, I expect the "industry" does have a notion of "commercial", "business", "personal" or whatever cards. But the definition in law (see my other blog post) does not follow that as it includes a notion of the card being "limited" to use for business expenses - that is a matter that is down to the company policy and not the card issuer, so any company can, if they wish, allow non company expenses on their "commercial" card which they reclaim from the member of staff later, and magically change the card to not be a "commercial" card in law. HMRC accept credit and debit card payments for tax payments, and have always charged a fee for credit card payments. This used to be a fixed 1.5% fee, then in 2016 it changed to a fee per card type (e.g., Visa Personal was 0.415%, MasterCard Personal 0.386%, Visa Business 1.508%, MasterCard Fleet Card 2.134%). As of the 13th, HMRC will stop accepting personal cards completely, but will continue to accept business/corporate cards with fees charged as before. Presumably they do have access to a suitable database of card BINs etc to work out what type of card the taxpayer is using. Well this one could be fun then. I have two personal debit cards and two business debit cards. All with the same bank. All four have near identical card numbers and certainly the first 6 digits are completely identical. I am not convinced there is any way for HMRC to tell which of these four is a business vs personal card. I expect debit cards don’t have the same distinction (and HMRC don’t charge a fee for them anyway). If your integration with the card systems is deep enough, you can interrogate the card network and get the card type before you start the transaction process - so HMRC can discover the card type that way. Yes Simon, but my point is that they cannot tell if it is a "commercial card" and hence allowed to charge a surcharge because the definition in law includes an aspect that is down to card holder internal policy - i.e. is the card "limited to use for business expenses", or not. So there is no way for any level of integration with the card system to say if a "commercial card" and so surcharges allowed or not. I do wonder, how much more expensive it is for a shop to take a card parment vs having to secure/transport cash. Except your corner shop can take cash and spend it in the cash'n'carry, or use it to pay staff (typically themselves), all of which with no charges. You also have to account for the theft risk if you're doing this properly. This is both the damage done in a theft (the difference between losing £10,000 in cash float from your store and £1,000 in cash plus card receipts for £9,000 preventing you from challenging any chargebacks), and the chances of a theft actually happening (there's a difference in risk/reward for the criminal between an armed robbery that nets £2,000 in cash plus £23,000 in card receipts, and one that nets £25,000 in cash). That said, I suspect that the card fees are currently higher than the theft risks are. Plenty of retailers put their copy of the card receipt in a separate bag/box, away from the cash drawer. Your post has now explained to me why they do that! Larger chains prefer to avoid the cash payments as they can't do anything with the cash other than cash back. They have to transfer the cash away to the bank as all the staff and suppliers are paid electronically. Found it - here's a list to decode card numbers. But, as you can see, doesn't identify whether 'commercial' or not. And I have several cards starting 3760xxx. But none are homed in Australia nor are they Nectar points cards. So, while the list is interesting, it is not reliable. But based on the definition no list can tell you a card is a "commercial" for this law, as it is partly down to company policy. Purely to illustrate: I have pulled out our merchant account contracts. We accept Visa (credit and debit including Electron), Mastercard (credit and debit and including Maestro), American Express (charge and credit). We accept cards 'homed' in any country that our system will process and obtain an auth code for. We don't take Diners Club, nor JCB, nor China UnionPay. But would be happy to look at getting merchant accounts for these should we suddenly have lots of US or China clients. Just for that our pretty common setup our contract lists 25 different categories of card we process. And spread across those 24 categories are 8 different charging rates. They range from a lowest rate of 50p to 61p flat rate or on the variable rates from 0.75% up to 2.4% and all depending on whether it is a Qualifying or Non-Qualifying Transaction. Only 2 of the 24 charging categories list 'corporate' in their description, but 3 of the categories include the word 'business'. 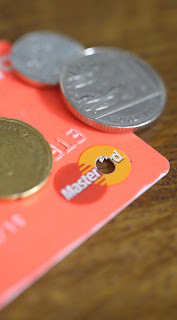 Then, on top of all that we add either 0.0425% or 0.4% for Mastercard and Maestro payments made by non-UK card and depending on whether the card is 'homed' inside the EU or outside the EU. I can't work out the 'home' domicile of a card as, for example, I have a client who is a German national, but with lots of business interests in the UK, but lives in Switzerland (outside the EU) and who also operates in numerous EU countries. So I wonder where his card is 'homed'? A bank in the UK ? Switzerland? Germany? Somewhere else? He pays my firm by card. Visa and AmEx payments from non-UK 'homed' cards ssem to attract no extra charge, unless Visa Electron, in which case they do attract it. But so far I have only listed the merchant account fees. On top of all that lot should be added the card terminal provider's fees per-transaction. Then, you need to consider that our card terminal provider charges a basic fee per month which includes the first £14.99 (?) of per-transaction and merchant account fees. But the £14.99 is not used to offset the first £14.99 of AmEx charges. So, if a payment from a customer is one of the first received by card in the month and therefore results in fees which fall entirely or partly within the first £14.99 of fees in that month and are non-AmEx, that has resulted in no cash charges levied against our business. We would have paid the full £14.99 even if we took no cards in that month. So, can we levy a surcharge gievn that a surcharge of 'no more than your costs' is debatable ? Madness to even try and have an understanding of the fee levied per card transaction prior to that transaction taking place and being reported on our monthly statements. Far easier for the law to simply say either "no payments surcharges whatsoever irrespective of payment method" or to say "the law is silent: you can levy any charges you like as contractually enforcable by the terms lawfully agreed between supplier and customer and as long as customer is fully appraised of total final cost prior to making final commitment to purchase". I agree, see my other blog post - I think any business trying to charge card fees for B2B is going to have issues, not just on the fact that the charge can't be more than cost, as you point out, but on the fact there is no way to know if the card is "limited to business expenses" or not, and hence a "commercial card". Exactly. The only 'safe' approach for a B2B txn will be to levy no fee. We shall see on Monday! In some cases merchant agreements seem to be overly complicated, and in others, merchants seem to choose horrible deals. I feel you'd likely be hard pressed as a retailer to incur lower costs than that banking cash! Obviously for other sectors (e.g. aaisp) bank transfers and direct debits are still likely cheaper. No idea if it's related in some way, but AmEx have just emailed and are offering next-day payout to the merchant. Currently we have payout on day 4. About to read the terms and see if there is some link to or mention of the surcharges ban. Read through the changes to the T&Cs. It does appear to be driven by various things in the new regulations, but not the surcharges ban itself. So, have signed up. Whole of EU so yes.